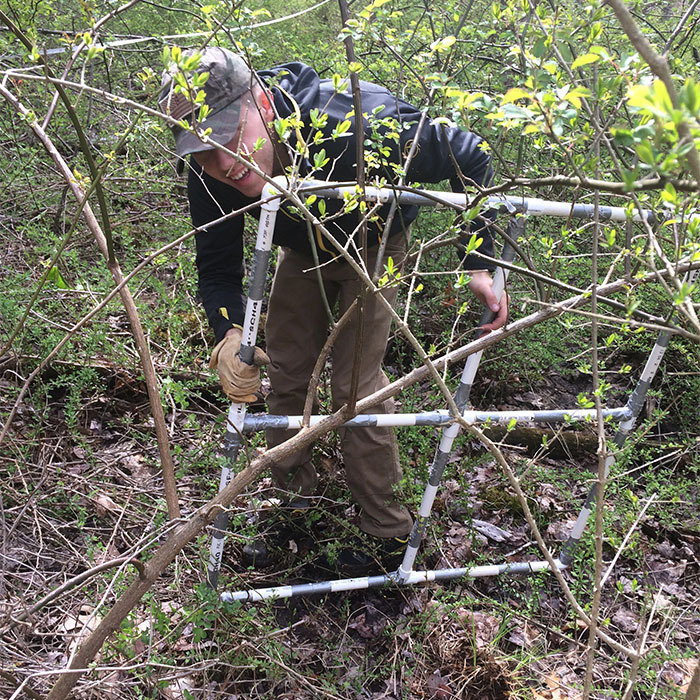 Recent ENVS alum Adam assessed different survey methods of Japanese barberry in Simsbury, CT. Adam specifically used transects and GIS to quantify the extent of invasion at our study site. Along each 50 m transect, Adam utilized a quadrat to count Japanese barberry density and cover. With GIS, Adam downloaded NDVI (normalized difference vegetation index) satellite data to map Japanese barberry locations, as you can see in the map below. The NDVI values closely align with the dense shrubbery that we associated with Japanese barberry from Adam’s transects. Adam trapped in the barberry with his quadrat. 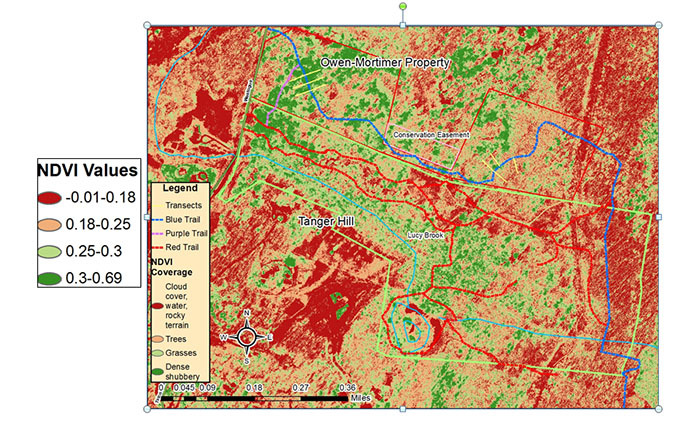 Map displaying 2016 NDVI vegetation coverage and their equivalent values within the study site. Blair, another recent ENVS alumna, investigated the invasivore movement, specifically as it related to Japanese barberry. The invasivore movement is a means of eradicating invasive species through human consumption. In the past, the fruit of Japanese barberry has been used to make…jam! Blair went to work by first conducting a strong literature review of the invasivore movement and how it became popularized. Next, she spent time in the kitchen! Blair was able to successfully produce jam from Japanese barberry, providing an alternative means of controlling this insidious invader. 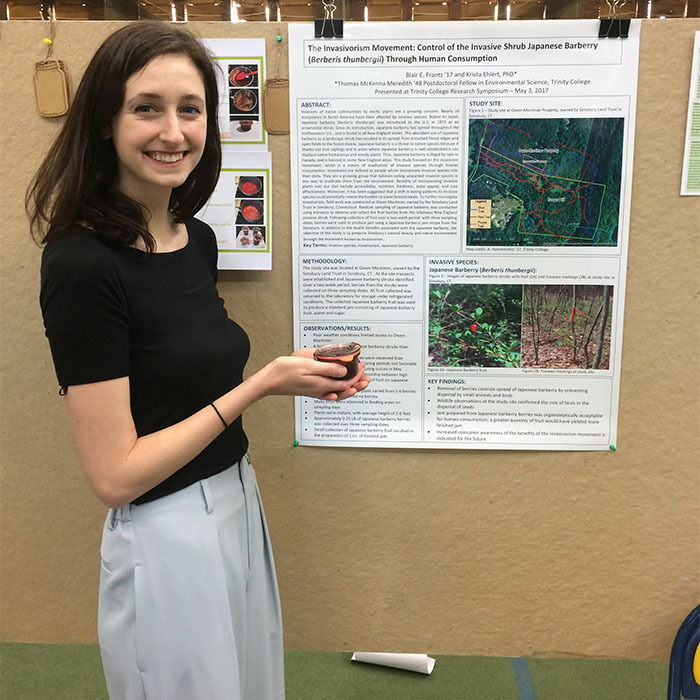 Blair holding the jam she produced from Japanese barberry fruit, alongside the poster she presented at the student research colloquium in Spring 2017. Soon to be ENVS alumna Corinne and I are investigating the role of horses as potential vectors of invasive plant seeds. Corinne and I are interested in this research question because we each have a horse! Horses are able to transport invasive seeds not only through their digestive tract, with seeds ending up in their feces (eek! ), but their manes, tails, and fur can also easily transport seeds. We’re focusing on the latter for Corinne’s research. 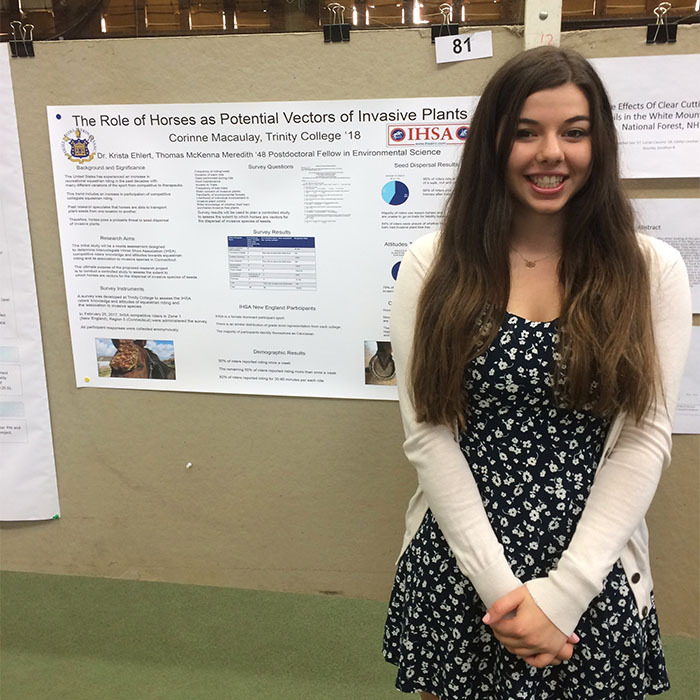 Corinne started her research by conducting a survey of Intercollege Horse Show Association (IHSA) horseback riders, to learn about their attitudes toward and knowledge of invasive plants. We will be expanding upon the survey by conducting experiments with our own horses and others to investigate how far seeds can travel when attached to their fur. Corinne presenting the results of her survey at the student research colloquium in Spring 2017. 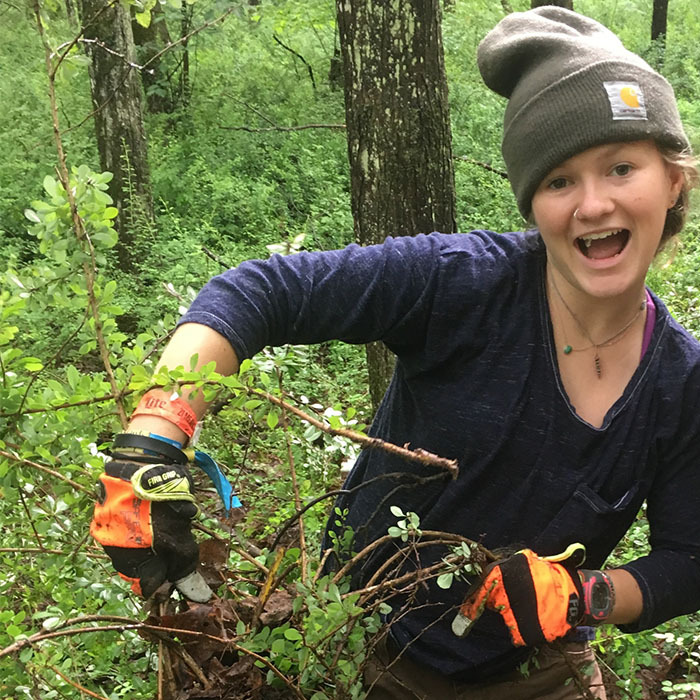 Another soon to be alumna, Bailey from the Biology department, spent the summer along with Blair helping me with the Japanese barberry research (see previous blog post!). Bailey will be expanding on this research for her senior thesis in the Biology department, and will be co-advised by Dr. Amber Pitt and I. Specifically, Bailey will be focusing on the effect of microhabitat on black-legged tick abundance on the white-footed mouse, Peromyscus leucopus. White-footed mice are reservoirs of Borrelia burgdorferi, the bacteria that causes Lyme disease. Ticks feed on mice for one of their blood meals, become infected, and move on to their next blood meal – often a human, thereby transmitting Lyme disease. Bailey will accomplish this research by using live-catch traps in the field, and counting tick load on each captured mouse; after counting is complete, the mouse will be released back into the wild. Overall, we hope that Bailey’s project sheds light on tick load on white-footed mice in a Japanese barberry infested forest. Biology student Bailey in the field with a Japanese barberry shrub that has been uprooted. That’s a wrap on what the Ehlert lab has accomplished and is currently doing! I’m actively looking for one or two research students this fall to help on the Japanese barberry project, so if you’re interested, send me an email at: krista.ehlert@trincoll.edu or stop by McCook 123! Or stop by if you’re interested in other invasive plant research!